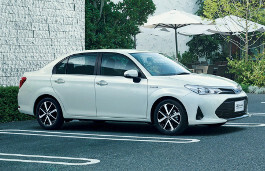 Correct Wheel Sizes, PCD, Offset, Rims and Tire specs for Toyota Corolla Axio series. Hi,axio,you can try 15*6.0 and ET is 39 and Bolt pattern is 5*114.3.
would 205/60/r15 fit in a '09 axio ? Hi,shiva maharajh,it can fit for your car. Hi,ari,the wheel size is 16*6.5.the offset is 45.the pcd is 5*114.3. 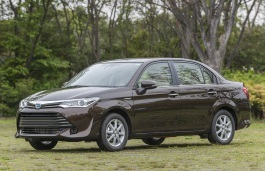 Hi everyone!i want to know, Is it possible to put 205/65/r16 on my 2013 toyota axio hybrid? I put the same tire on my civic 97.. and its drives well. No troubles at all. Both cars looks same on dimensions.. so do guys think it is okay to put that tires to axio? Hi,Yash,According to my data,the stock tire size for your car is 205/55/16.So 205/65/16 can't fit for. Thanks john really appreciate that. Stock size is actually 14.I m thinking of putting 16 wheels. Then ill use 205/55/r16.. thanks again. will 18'x8 wheels with center bore 67,1 mm offset 40 bolt patern 4x100 fit my toyota corolla axio 2011. Hi,Mohamed,If you want bigger tires,you can try 15‘’-17‘’ tires.Size you can try 205/60/15,205/55/16..and if you want bigger size tire,you also need to change wheels. 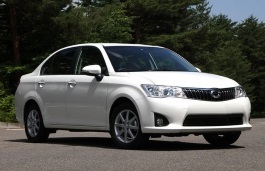 Hi everyone!i want to know, Is it possible to put 225/65/r16 on my 2011 toyota axio? 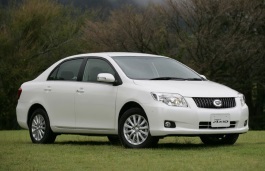 My Toyota Axio x 2011 present size is 195/65/r15 which is as recommended by Toyota. But I want to put here 205/55/r16 as you advised. Is there required any modification in car where I want to put r16 in place of r15 as my present car condition. Please advice me. Hi,Sohel khan,If you want to put 16'' rims,You need pay attention to the wheel offset and rims width.You can try offset 45mm and the rims width you can try 6.5‘’. Thanks for your positive advise. But will I face problem with my car of using this. I am hearing here 'if I converting to 16" rm replacing 15" rm then my car may not able to balance when driving. Please advice If you are confident not to face any difficulties using this this as per your instruction then I will put it here in my car today. Hi,Sohel Khan,I think it is ok to use that.But to avoid any difficulties,You can ask your local wheel dealers to test the wheel balance after fixed. Hi John, can you advice me if I put the largest tyre size with 16" wheel, will it be any problem then. If not can you tell me the specification of that size please. Will it be fit for my Toyota corolla Axio 2011 car. it will very help for me if you guide me as an expert one since I have not found here for this kind of technical advice for me. I will b very grateful to you in this regard. Hi, sohel khan，If you want to put the larget tyre size,You can try 215/55/16 or 205/60/16,The difference between them is the aspect ratio,The first one will be little lower than the second one,You can decided on yourself. Hello Jhon Bro , i want to fit 17'' rim with 225/45/17 or 215/45/17 on my 2010 Axio . how it will be ? I have AXIO 2008 with tire R14, can I put R15 without any problem in performance and stability. HI, Muditha,yes.you can try it. I wanted to change the tyres of my Axio Hybrid 2014 , which tyres I should use, because its original tryes are of R14 and the car hits every road bumper / speed breaker. Hi,fawad hussain,You can try 175/65R15,this tire is also 15'' stock tire size.